George Tsunis, head of the public benefit corporation that runs Nassau University Medical Center, calls a unit of the nonprofit a "patronage pit." Nassau legislative Democrats are seeking public hearings into the Nassau Health Care Foundation, after the head of the public benefit corporation that runs Nassau University Medical Center branded a unit of the nonprofit a "patronage pit." 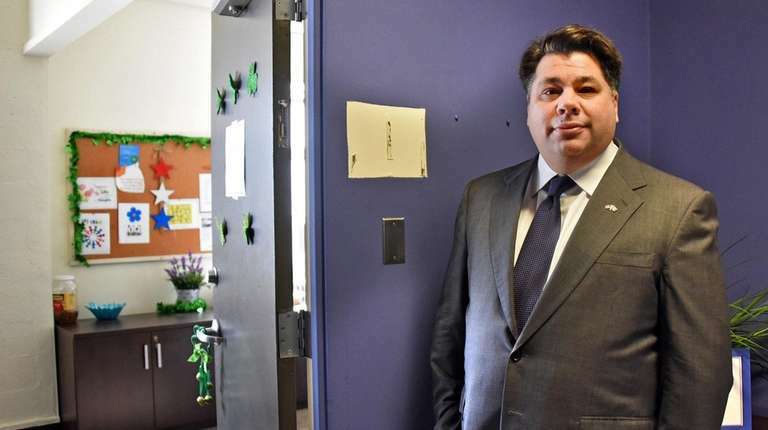 George Tsunis, chairman of NuHealth, said he has shuttered a key division of the foundation because of concerns about its spending and hiring practices. A Newsday story last month revealed that the nonprofit had received almost $41 million from NuHealth since 2010, and had spent more than $34 million on salaries. Federal tax returns show the number of foundation employees increased from 61 in 2010 to 101 in 2017. In a letter Friday, Minority Leader Kevan Abrahams (D-Freeport) and Legis. Delia DeRiggi-Whitton (D-Glen Cove) urged presiding officer Richard Nicolello (R-New Hyde Park) to “immediately schedule a public hearing into the activities” of the division, called a professional employee organization. The hearing would review the PEO's "impact on the fiscal stability” of NUMC and NuHealth, according to the letter. “The issues raised by Chairman Tsunis should set off loud alarm bells for all of us in county government," the letter says. "They beg the troubling question of whether, under its prior leadership, the PEO, the foundation and even the hospital itself were diverted from their critical public health purposes and converted into a corrupt enterprise to enrich politically connected patronage employees." Abrahams and DeRiggi-Whitton said a hearing was “essential" to determining “who was responsible for the operations of the foundation and PEO" — as well as who was hired, how much they were paid, what outside vendors were paid, and "whether any political influence was exerted on the hiring process." Frank Moroney, spokesman for the GOP legislative majority, said, “We don’t see a need for it [hearings] at this time." He said the legislature should "... not get in the middle of a turf war between the current President and the PEO leadership, each of whom disagree over the value added by the PEO to the County Hospital." The PEO administered short-term grants and programs and provided temporary employees to NUMC. The foundation was established in 1964 to help the former Meadowbrook Hospital, NUMC's predecessor. Earlier this month, the foundation’s two board members resigned, and the remaining employees resigned or were terminated, meeting minutes show. “The PEO has dissolved,” Tsunis said in an interview. Tsunis and NuHealth board members Michael DeLuca and Steve Cohn have taken positions on the foundation's board. “Three new directors have been appointed to the foundation, and it will return to its original mission of helping the hospital,” Tsunis said. Peter Fishbein, who had served as an attorney for the foundation, did not respond to a request for comment.